Bogota, Colombia is nestled high in the Andes at 2,620 meters or 8,646 feet. It's a city of contrasts: high-rise buildings standing next to colonial churches, universities, theaters, and shantytowns. Bogota is also a mixture of influences – Spanish, English, and Indian. It's a city of great wealth, material well-being – and abject poverty. Wild traffic and calm oases sit by side. You'll find futuristic architecture, graffiti and congestion here, as well as restaurants, bookstores and street vendors peddling emeralds. Thieves, beggars, street people and drug dealers call the inner core of the old city their home. Santa Fé de Bogotá was founded in 1538. Its name was shortened to Bogotá after independence from Spain in 1824, but it was later reinstated as Santafé de Bogotá. The city was quite provincial until the mid-1900s, the bureaucratic home of government and intellectual pursuits. The main industries were breweries, woolen textiles and candle making. The residents – or Bogotanos – were viewed by the rest of the country as taciturn, cold and aloof. The Bogotanos saw themselves as intellectually superior to their countrymen. In addition to being the capital, Bogotá is Colombia's largest economic center. Most companies in Colombia have their headquarters in Bogotá because it's home to most foreign companies doing business here. It's also the hub of Colombia's main stock market. The main offices of most coffee-producing, exporting firms and flower growers are located here. The emerald trade is a huge business in Bogotá. Millions of dollars in domestically produced rough and cut emeralds are bought and sold daily downtown. Zona 1 Norte: This is the most modern, upscale zone. The highest income bracket neighborhoods, important commercial centers, and the best restaurants, shopping centers and nightlife are located in the zona rosa. Zona 2 Noroccidente: The city is growing out in this direction. Zona 3 Occidente: This western sector contains industrial areas, parks, the National University and El Dorado Airport. Zona 4 Sur: The industrial zones and large labor barrios are located in the south. Zona 5 Centro: The central sector is the city's chief and most important commercial, cultural, governmental and financial zone. Zona 6: This zone covers the surrounding areas. Zona 7: This zone includes other cities. 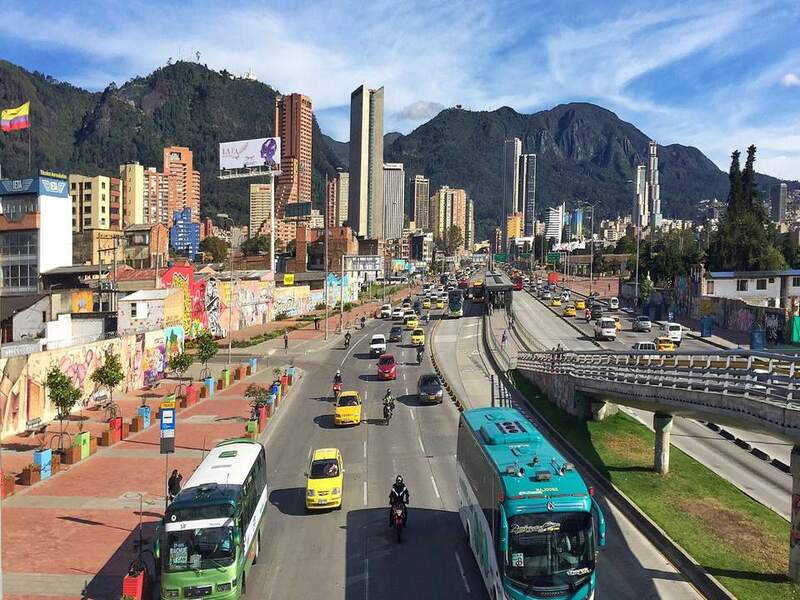 Most places of interest to visitors are located in Bogota's central and northern zones. The city has expanded from the colonial center where most of the great churches can be found. The mountains provide a backdrop to the east of the city. The most famous peak is the Cerro de Montserrat at 3,030 meters or 10,000 feet. It's a favorite with Bogoteños who go there for the spectacular view, the park, the bullring, restaurants and a famous religious site. The church here with its statue of the Señor Caído Fallen Christ is said to be a place of miracles. The top of the peak is accessible by climbing hundreds of stairs – not recommended. You can also ride up by cable car which runs from 9 a.m. to 11 p.m. daily, or by the funicular which runs only on Sundays between 5:30 a.m. and 6 p.m.
San Francisco: Built in 1567, this church is elaborately decorated with a huge wooden altar and columns covered with gold leaf. Santa Clara: Built early in the 17th century, this single nave church has wonderful frescos that have been completely restored. It's now a museum. Its once cloistered convent of nuns has now dismantled, but the church has an exceptional screen that was once used to hide the nun's choir. San Ignacio: Inspired by the Church of San Jesús de Roma, this sumptuously decorated church has very high naves, Baroque altars, and sculpture by Pedro de Laboria. San Agustín: Built in 1637, this is one of the oldest churches in Bogota and it has been restored. Most notable among its features are the Baroque altars, the choir and the beautiful proportions. The La Tercera, la Veracruz, la Catedral, la Capilla del Sagrario, la Candelaria la Concepción, Santa Bárbara and San Diego churches are all worthy of a visit if time allows. The city has a number of great museums. Most can be seen in an hour or two, but be sure to schedule plenty of time for the Museo del Oro, the home of more than 30,000 objects of pre-Colombian gold work. The museum is like a fort protecting the treasures here, including the tiny Muisca boat depicting the ritual of throwing gold into Lake Guatavita to appease the gods. The museum also showcases emerald- and diamond-studded crosses from the colonial period. Museo Colonial: Housed in the old Jesuit monastery built around 1640, this museum displays the life and times of the Viceroyalty period. Museo de Arte Religioso: Exhibits include a collection of religious art popular in colonial times. Museo de Arte Moderno: This museum houses the work of contemporary artists. Quinta de Bolívar: Located at the base of Cerro Montserrate, the magnificent country home of Simon Bolívar displays the furniture, documents, and items for personal use of the Liberator and his mistress Manuela Sáenz. Don't miss a stroll through the lawns and gardens. Other museums of note include the Museo Arqueológico Museo de Artes y Tradiciones Populares Museo del Siglo XIX Museo de Numismática and the Museo de los Niños. You might be interested in the model of the Ciudad Perdida, the Lost City of Taironas that was found near Santa Marta in 1975. This discovery of a city larger than Machu Picchu is one of the most important archaeological finds in South America. The highlight of any visit to the Gold Museum is the strong room where small groups of visitors can enter a darkened room and audibly gasp when the lights reveal the 12,000 pieces held here. The Museo Nacional de Colombia has a broader range of display of archaeological ethnic and historical importance. This museum is housed in a prison designed by American Thomas Reed. Cells are visible from a single observation point. The Cathedral of Zipaquira or cathedral of salt is not in the city proper but it's well worth the two-hour drive north. The cathedral is built in a salt mine that was working long before the Spaniards arrived. A huge cavern was created by the 1920s, so large that the Banco de la Republica built a cathedral here, 23 meters or 75 feet high and with capacity for 10,000 people. Colombians will tell you that there is still enough salt in the mine to supply the world for 100 years. There's enough to see in Bogotá to keep you busy for several days. When you've had enough of museums and churches, the city offers an active nightlife with restaurants, theaters and more. Plan to visit the elegant Teatro Colón during a performance – it's the only time the theater is open. Getting around the city is simplified by the way the streets are named. Most of the older streets are named carreras and they run north/south. Calles run east/west and are numbered. Newer streets may be avenidas circulares or transversales. Bus transportation is excellent in Bogota. Large buses, smaller buses called busetas, and the microbus or colectivo van all travel the city streets. The Transmilenio modern articulated buses operate on selected main streets, and the city is dedicated to adding routes. Bicycles abound in the city. The ciclorrutas is an extensive bike path serving all points of the compass. "Colombia is currently the most dangerous place in the Western Hemisphere and perhaps the world because it is not considered a war zone .... If you travel to Colombia, you could be the target of thieves, kidnappers and murderers ... Civilians and soldiers are routinely stopped at roadblocks, dragged out of their cars and summarily executed in Antioquia Department. Tourists are drugged in bars and discos then robbed and murdered. Expats, missionaries and other foreigners are favorite targets of terrorist groups who kidnap them for outrageous ransom amounts that climb into the millions of dollars." Let your consulate know you are there and what your travel plans are. Carry your passport with you at all times. You may be asked for it at any time. If you're in doubt about the person asking to see your documents, call any uniformed police officer for assistance. Carry with you only as much money as you'll need and keep it close to your skin. Don't wear valuable jewelry or watches. Don't walk alone at night or in slum areas. Avoid any dubious areas. Women should not get into taxis alone. Do not accept candy, cigarettes, drinks or food from strangers. They may be drugged with burundanga which takes away your will and memory and causes unconsciousness. An overdose may be fatal. Be aware of local news and events. Stay away from trouble spots. Do not walk up to Cerro Montserrate. Be aware, be cautious and be safe to enjoy your trip!